Athens, Istanbul, Mykonos, Patmos, Kusadasi, Rhodes, Agios Nikolaos/Crete & Santorini. Transfer to the port. Embark on the ship. Sail, 5:00pm, to Istanbul. Arrive Istanbul at 3:00pm. Overnight on board the ship. Day free in Istanbul. The ship sail at 7:00pm for Mykonos. The ship arrives in Mykonos at 3:00pm and sails at 12.00am. Today we visit two ports of call. 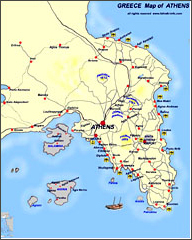 Patmos, (7.00am to 10.30am) and Kusadasi, (2.30pm to 8.30pm). The ship arrives in Rhodes at 7:00am and sails at 6:00pm. Today we visit Ag. Nikolaos, (7:00am to 11:30am) and Santorini, (5.00pm to 9.00pm). Arrive at the port at 6:00am and disembark.